5 Bedrooms, 5 en-suite bathrooms, 1 guest cloakroom, sleeping up to 10 guests . dishwasher and the utility room houses the washing machine. to Zakynthos and then inland to Mount Ainos. correct licences and public liability insurance. of April 2012. The flight prices look quite reasonable and will make your luxury villa holiday just that bit more affordable. Unique to Helena is an 80 sq.metre swimming pool .12metres long x 6 1/2 metres wide,not just a pool to play in, an actual swimming pool. Of course we are one of the few villas on the island to have it's own private tennis court so the whole family is entertained, from seniors to the younger children.Dan has vast local knowledge and speaking both Greek and English .He is also an excellent gardener and our guests enjoy the benefits of his superb organic vegetable garden and many different fruits from our orchard. Our small vineyard and olive grove are within the grounds of the villa and our guests can enjoy our wine and olive oil if they wish.He speaks Greek and English fluently which is really helpful for our guests. We are a small family business and work hard to ensure our guests really do have a unique and memorable holiday. Please fill in an enquiry form so that we can email you our private web site address for more detailed information regarding our villa. OMG - Villa Helena (or Pauline as it's now known) is a wonderful villa. It has everything you need for a larger party. En suite bathrooms to all 5 bedrooms, air conditioning, insect screens at all windows and doors (not that there were many). Great well equipped kitchen and above all 1 large fridge/freezer for our food and ice and another large fridge for all our drinks - beers, wine, tonics, sodas etc etc. Large utility room with a washing machine. The outdoor areas were perfect with nooks with shade and sun and, of course, the pool was perfect. The view is to die for. There is a small mini market very close by and a taverna within walking distance (although this maybe closed by the end of September). I would most heartily recommend this villa. villa helena is the nicest villa we have stayed in. Each bedroom has its own bathroom and one of the bedrooms was on the ground floor so perfect for my mother in law. The villa was so clean and very well equipped. The outside area is very spacious and there are two eating areas- one cool for breakfast and the other perfect for lunch or dinner. There is big barbecue. The pool is lovely- big and very clean. The villa was cleaned twice a week and sheets changed too. The surrounding area is very quiet and the villa is not overlooked. There is a small mini market within walking distance which is well stocked and the owners are very helpful. There and many lovely tavernas around- a car is neccessary. We spent a lot of time at Avithos Beach which is fabulous . All in all a wonderful place. Stunning immaculate property,perfect in every way for our party from 2 to 87 ! Dan was brilliant host who could not do enough for you. The villa is amazingly equipped and beautifully maintained,ideal for friends or a family group with each bedroom having a lovely bathroom. The pool is a dream and again very well maintained. It was very private but we found beaches and tavernas a short drive away with a mini market two mins walk away for emergency milk ,beer etc. It is a special experience at Villa Helena and I would recommend highly. 5 adults and 3 children spend a week here and what a choice. The Villa was fantastic. There is nothing more to say. Everything you could have wished for to make a perfect holiday was there. It wasn't just the villa. The grounds and the location just add to the overall effect of making our holiday the best it could be. Dan met us at the airport guiding us through everything we needed to know to ensure we had a good holiday. He was good enough to tell us he was available night and day if we had any issues. There wasn't a need as the week went like clockwork. A car is essential although the children would have been quite happy to stay in the pool or play in the grounds all day every day. We are all in agreement that at some time we must return. It was our 50th anniversary and decided to take our children/partners and grandchildren away for a weeks holiday 10 of us in total. The villa was easy to find using Helens instructions and only approx. 20mins drive from the airport. On arrival at the villa Giannis was waiting to give us a guided tour and to explain the workings of the villa which was very much appreciated. The Villa itself was faultless a really beautiful location, built to a very high standard and with views to die for. In addition it was very well equipped and fitted out with everything one may need, the garden landscaping was fantastic with loads of space for the kids to run around in, the very large infinity pool and the outdoor dining BBQ area and tennis courts a big hit for old and young alike. We hired cars which if you are adventurous like my family came in useful for day trips out, although there are some good beaches and very good restaurants quite near by, our favourites of which we highly recommend were Marina`s by the sea at Lourdata beach and the Olive Tree (more local) .It is also worth a visit just for the view to Lorraines Magic Hill restaurant at Lourdes beach if you are okay with a few steps to climb, the food makes it well worth the effort. I could go on and on about The Villa Helena but suffice to say we had the most relaxing and tranquil holiday for a long long time and all my family young and old have vowed to come back again sooner than later. I would like to thank Helen & Giannis for being so helpful and letting us have the use of their beautiful home . Kindest Regards Chris & Elfreda Gullick. To the Gullick family - thank you ! gradually slip away. I think we achieved this goal for your family and we would love to see you again. Wow, Amazing villa, grounds and location!! Have just sadly come home from a 10 night stay here and we were all just blown away by the Villa and grounds! If we could have stayed longer we definitely would have. A family of 7 with young boys, a late teenager and an older person and it catered for everyone perfectly. The swimming pool and tennis court were just amazing and kept us all entertained for hours. To each have our own room and bathroom too was just so nice; no fighting for the shower in the morning! 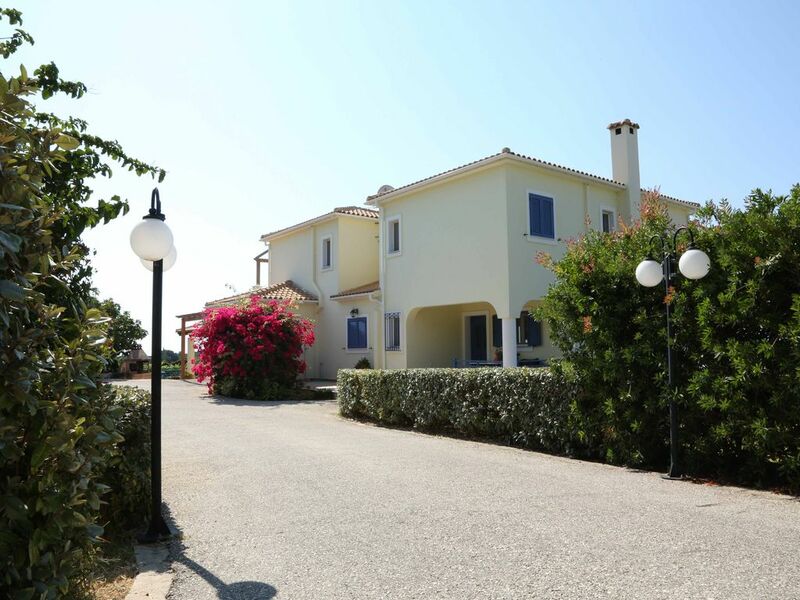 The location of the villa is perfect, nice and quiet to really appreciate the break yet not too far if you want to go out sightseeing or at night-time. Yannis and Helen were so nice to us too, very prompt and helpful in every way possible which really did have a massive impact on us. Have already recommended to others and would definitely go back again! Thank you so much Helen and Yannis for all your help before and during our stay, it really meant a lot to us all and your villa is just PERFECT! Mount Ainos. The sleepy village of Klismata is a short walk from the villa, the local beach Paliolinos, is within walking distance if rather a steep climb on the way back, the blue flag beach of Avithos is a five minute drive away.Spartia beach is also delightful and a few minutes drive away. Our nearest taverna is a short walk along the country lane in front of the villa, the nearest mini market is in in the village of Spartia, a few minutes drive away. The above rental rates are up to and including 10 guests. The security deposit will be returned when the villa has been checked over by giannis and returned asap by bank transfer.